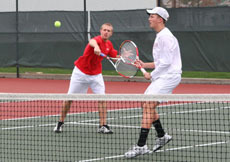 Wabash picked up two victories Saturday in a pair of tennis matches, including its first win in North Coast Athletic Conference for the 2011 season. The Little Giants scored an 8-1 victory at Ohio Wesleyan before sweeping Capital 9-0. The Little Giants opened play Saturday morning by winning all three doubles matches against OWU. Daniel Delgado and Wade Miller were 9-8 (7-4) winners in the first flight, while Peter Gunderman and Ricky Ritter scored an 8-5 win at number two doubles. Evan Bayless and Ian Leonard picked up an 8-0 win in the third flight. Delgado started a swing of straight sets victories in singles play, winning 6-3, 6-2 at number two singles. Zach Lowry earned a 6-4, 6-4 win at number three singles, while Miller picked up a 6-3, 6-3 victory in the fourth flight. Ritter was a 6-1, 6-2 winner at number five singles, while Leonard won 6-4, 6-3 in the sixth flight. Wabash was nearly perfect against Capital in the nightcap. Gunderman started the singles string of victories with a 7-6 (4), 6-1 win in the first flight. Delgado, Lowry, and Miller all posted 6-0, 6-0 wins at second, third, and fourth singles, respectively. Ritter won 6-2, 6-0 at number five singles. Nate Koelper earned the final singles victory with a perfect score of 6-0, 6-0 in the sixth flight. Miller and Delgado won 8-3 at number one doubles. Ritter and Gunderman picked up an 8-4 victory in the second flight, while Bayless and Leonard combined for an 8-1 victory in the third flight. Wabash improves to 3-1 with the victory and 1-0 against NCAC opponents. The Little Giants return to action Wednesday with a 5 p.m. home match against Earlham College at the Collett Tennis Center.